For many gardeners, the sight of a stately, mature conifer is awe-inspiring. Some of us are lucky to have one in our gardens, but their sheer size makes it difficult to accommodate more than one or two. Fortunately, for those who wishfully imagine an assortment of these interesting denizens in their city garden, there is a solution to this dilemma. The answer: think small. A wide range of dwarf conifers is available, and that number is growing as gardeners discover their unique charms. A visit to The Oregon Garden, home to one of the country’s greatest conifer collections, jumpstarted my interest in dwarf varieties. Plants in the OG Conifer Garden come from all over the world—some so rare as to only be found in this specialty garden—and include an impressive display of dwarf species and varieties. That experience blossomed into creating a dwarf conifer bed in my own garden. At first it seemed too good to be true; could I really have that many cool conifers, all in a 12- by 6-foot bed? It turns out you can. When planting any specialty garden, planning is in order. You will need to pick the right location, select from the various growth habits, and plan for the mature size of the conifers, all while keeping your design in mind. Dwarf conifer growth habits fall into one of five basic shapes: prostrate types, which act like ground covers; mounding shrubs that range in height from one to three feet; mid-sized, pendulous forms that are upright but have a cascading habit; tall, narrow plants that have a columnar habit with growth to six feet; and tall, fuller types that reach the same height but display more girth. Once you begin to shop for suitable plants, the different forms will become more apparent. Although you don’t have to include plants from each of these groups in your conifer garden, variety is pleasing to the eye; contrasting shapes offer their own type of complementary beauty. 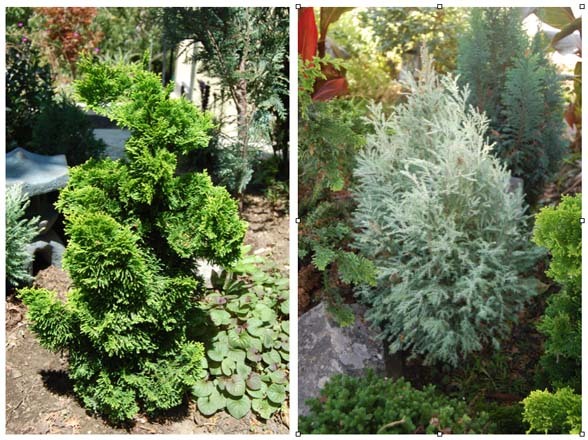 Color and texture are also key features to keep in mind when choosing your conifers. Although green, blue, and gray dominate the conifer color palette, other selections provide vibrant golds and silvers. Some gardeners prefer to stick to a palette of cool hues, others find the addition of even a single gold or silver plant enlivens the bed. Blues show up in surprisingly diverse tones. 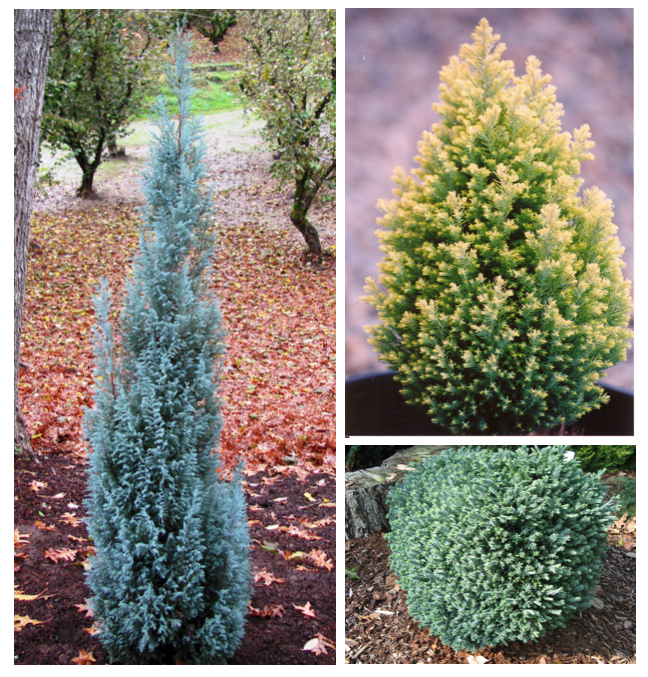 Picture the rough textured, glaucous blue of Juniperus squamata ‘Blue Star’ compared to the silky, richer blue of the columnar Chamaecyparis lawsoniana ‘Blue Surprise’. There are surprisingly good selections of silver and gold options. Chamaecyparis pisifera ‘Snow’ showcases silvery tips on new growth, while C. lawsoniana ‘Barry’s Silver’ positively glows, providing an attractive focal point among softer hues. Chamaecyparis lawsoniana ‘Treasure Island’ adds an upright splash of gold to any bed, while Cedrus deodara ‘Feelin’ Sunny’ offers a brilliant golden cascading habit. Certain selections change color depending on the season. Spring growth on Chamaecyparis obtusa ‘Nana Lutea’ is gold before aging to lime green. The green leaves of Cryptomeria japonica ‘Vilmoriniana’ take on bronze tones in winter. In perusing dwarf conifers, you’ll find that there are a seemingly infinite variety of curious shapes like the contorted, curly foliage on Chamaecyparis pisifera ‘Curly Tops’. The extremely twisted, curling branches of Cryptomeria japonica ‘Spiraliter Falcata’ remind me of Medusa’s head. The dwarf mugo pine (Pinus mugo ‘Pumilio’) offers everything distinctive about pines, but in a manageable three- to five-foot size. Designing an attractive dwarf conifer bed is like envisioning any pleasing environment, indoors or out. With the right combination of colors, textures, and shapes your finished little garden will look as if it has always been there. 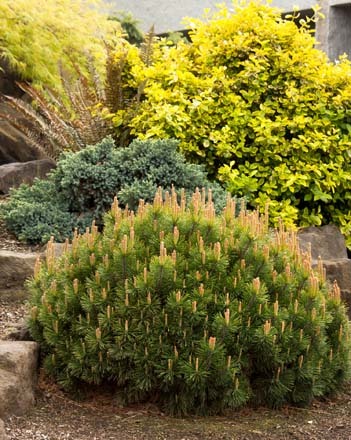 For most of us dwarf conifer lovers, the ideal look is simple and feels natural. But remember, you’re creating this conifer garden based on what you like. Beyond commonsense spatial considerations, feel free to create this little oasis as befits your own imagination. Other design elements can also be incorporated into a conifer garden. My own bed has a Japanese flavor and so I’ve added two cement statuary pieces commonly found in traditional Japanese gardens. I’ve also added lichen-covered rocks to further complement this look. Possible companion plants include low-growing hellebores, woodland violas or irises, club moss (Selaginella) or Japanese forest grass (Hakonechloa). Berberis, dwarf Japanese maples, Nandina, or Loropetalum are mid-sized selections that provide contrasting texture or color. 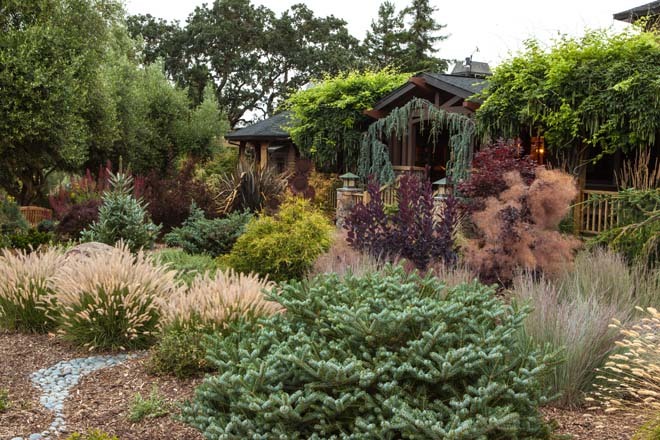 You may even decide to fold dwarf conifers into a larger landscape composition, as Sara Malone has in her striking Petaluma garden. 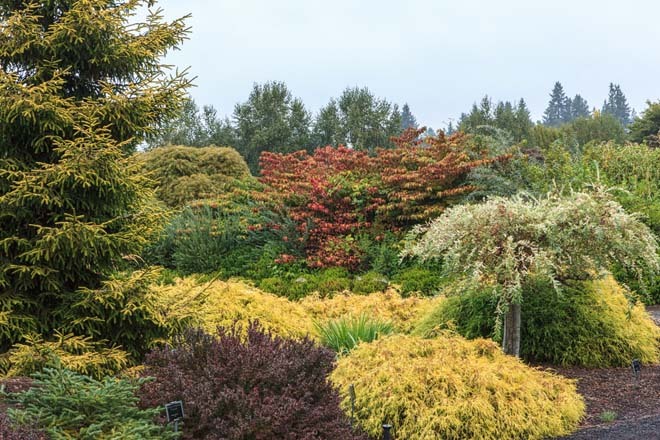 She mixes dwarf conifers with larger conifers and deciduous trees such as smoke bush (Cotinus) and crabapple (Malus) with broad-leaved evergreens like Phormium and Abelia for color and seasonal interest. 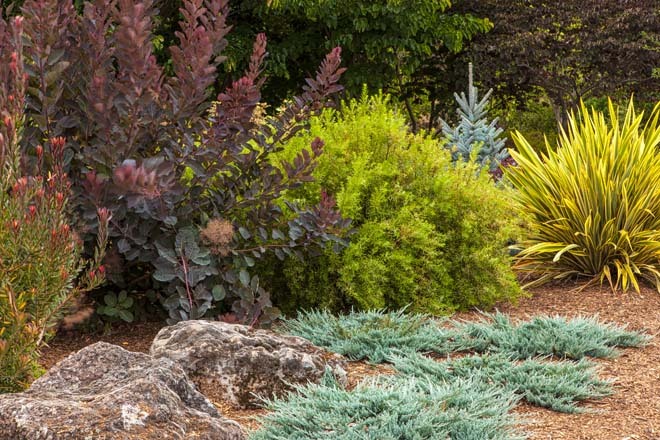 Whichever route you take—a bed devoted to dwarf conifers or dwarf conifers integrated into a larger landscape—these miniature marvels will add lasting appeal to any garden.